“I was introduced to the Charlotte AHEC HEROES program when I was 16 years old. I was a rising junior at an alternative school and a new teen mother. I had generally done well in school, but I felt like I was beginning to lose my way. College didn’t seem like a realistic goal for me since I had a little baby and I really hadn’t taken any interest in a specific career. After really taking time to consider my future, I realized that I needed to help people. So many people came together to help me and my daughter, so what better way to repay them than paying it forward? Michelle Boyd from Charlotte AHEC took me under her wing in the HEROES program and completely opened my eyes. She taught me how to be a young professional, how to network, and not to be afraid to go out and give something new a try. Because of the AHEC HEROES summer program, I was able to visit schools with some of the top health care programs in North Carolina and take a look into careers that I began to take interest in. It was at that time that I realized that any of those careers could be mine. It took some trial and error, but I can definitely say I’m on the right track now. Even after getting a degree in another field, I kept my love of health care with me. After graduating from East Carolina, I came back to Charlotte and pursued my nurse aide certification. 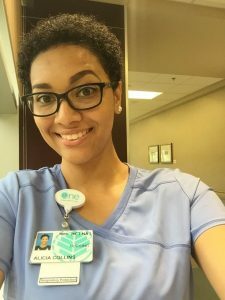 Within a year, I was a CNA, enrolled in nursing school at Carolina’s College of Health Sciences, and now working for CMC Pineville as a Health Care Technician.